Talking Through the Pages of "Butterfly Kisses and Wishes on Wings"
When speaking with a child about cancer, the discussion should be age appropriate and tailored to that child's stage of cognitive and emotional development. With this in mind, we have created Talking Through the Pages, a guide for additional discussions that may arise while you are reading our story. Use what is written below as you deem appropriate, remembering that this book is your resource. Make the experience you are about to share with the child your very own. 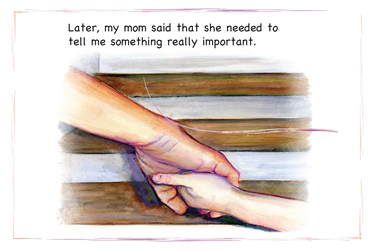 It is important to note that while Butterfly Kisses and Wishes On Wings Book is about a little boy and his mother, it can truly apply to the relationship between any child and any important person in that child's life diagnosed with cancer. It could be the child's grandparent, sibling, friend, neighbor, or even a teacher or coach. A butterfly kiss is simply the fluttering of one's lashes on another person's cheek, thereby tickling that person's cheek. It is a special and different way to show others that you love them ... Butterfly kisses and Eskimo kisses (rubbing noses together) are simple gestures of affection. 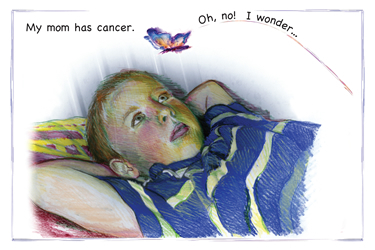 Perhaps you are reading this story to a child because he/she has someone in his/her life with cancer. Perhaps you are simply reading it as a "loving story with a message" to your child. No matter what the purpose is, prior to reading Butterfly Kisses and Wishes On Wings Book, you may want to explain to the child why you have chosen to read our story. Or, you may wish to wait until you have finished the book and ask the child why he/she believes you chose to read it. Once again, this is your guide; you decide what would be best for the child listening to the story. Discuss the feelings of "worried" and "sad" mentioned on these pages. Ask the child if he/she has ever been worried or sad about something. If things around the home have been different or unusual lately, you may want to discuss this with the child. It will reassure the child that you too are aware of the changes that have been going on, and will hopefully be comforting to the child. There are many wonderful resources on the internet for you to turn to as you look for the right words to explain cancer to the child. Recognizing that children of all ages may be reading this story, we purposely kept the explanation simple. We have listed some excellent website resources that can provide you with more in-depth explanations of the disease, and offer recommendations on how to talk to kids at each of the different developmental levels. Please visit our Links & Resources page to view the list. If you know the type of treatment the cancer patient will be receiving, share it with the child, if deemed appropriate. The significance of these pages is primarily to provide hope, as well as to share some of the common side effects that the patient may have to deal with during the treatment process. In addition, the child needs to be reassured that such major decisions do not fall on him/her. Treatment recommendations and procedures are made by doctors, the cancer patient, and other adults; not by children. Some children may wonder if they are responsible for causing the person's cancer. Some begin to believe that they may have said or done something "naughty" or "upsetting" that would have caused the cancer to develop. It is imperative that children understand that this is not possible, and that they did nothing wrong to cause the cancer. Additionally, children need to be reassured that cancer is NOT contagious. Encourage the child to ask questions that may concern him/her regarding these two critical topics. Engage the child in brainstorming different activities that he/she can still do with the cancer patient. Make a list of all the things they love to do together, reassuring the child that those activities can continue without cause for concern of "catching" the cancer. As you develop this list, however, you will need to keep in mind the health of the cancer patient, and what in fact they will be able to do physically once treatments/surgeries begin. Be honest with the child. If the activity will be too strenuous for the cancer patient, let the child know, and choose something that will be more appropriate. 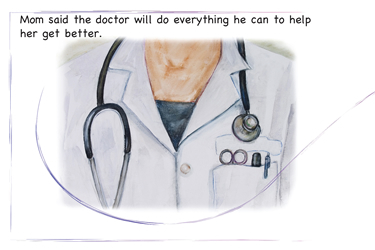 If appropriate, talk to the child about the doctor(s) who is (are) treating the patient. If the child is old enough, talk about the role of the doctor(s), and how the doctor(s) will help make the best medical decisions and treatment plans for the patient (along with other adults involved with the patient's care). Remind the child that medical and treatment decisions are for adults to make and not the child's responsibility. After reading these pages about the chores the young child plans to do for his mother, ask the child you're reading with if he/she would like to help the person in his/her life who has cancer. While the responses could certainly be the same as those listed in the book, help the child think about his/her relationship with the person, and encourage the child to come up with ideas that are practical, relative, and supportive. On our website, we have a created a special form titled, My To-Do List for___________. You and the child you are reading with can use this form to record his/her ideas. Visit our My To-Do List Page. This will allow you to access and print the form. "Everyone needs a break now and then" ... They sure do! And children living in the same home as a loved one who has cancer are no exception. Children need to be able to maintain as normal a routine as possible during stressful times. Keeping them on the same schedule as they had prior to the cancer news (dance lessons, baseball practices, piano lessons, etc.) provides them with a needed sense of security and alleviates added stress. Children need to be able to still be kids - having fun, running around, making noise, playing hard. Giving children a safe and nurturing place to "be in their childhood" is essential for their health and well-being. If the child you are reading with is living in the same home as someone with cancer, ask the child with whom he/she might like to spend the night sometimes "just to get away and have a break." Nanci and I have provided coloring sheets/journal pages that you may download for the child to use for drawing/writing. Visit our Coloring/Journaling Pages. Choose the sheet(s) the child would like to use and start drawing/writing! 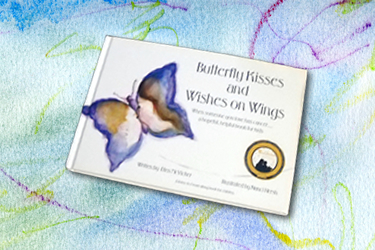 These Butterfly Kisses and Wishes on Wings forms may be printed time and again, giving the child an avenue for self-expression throughout this cancer journey. 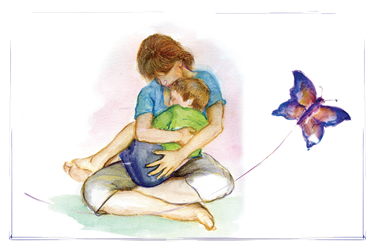 If age-appropriate, ask the child you are reading with what he/she thinks the child in the story means when he says, "Now, more than ever, I need to be my mom's butterfly." This discussion could lead to such topics as wishing, hoping, praying, and perhaps other spiritual themes. As you are reading the story, children may have many questions. Encourage the child to share his/her thoughts, feelings, questions, etc. If the child has questions that you cannot answer, simply say, "I don't know." As the reader, you are not expected to have all the answers. Let the child know, however, that you will find out the answers and get back to him/her. Giving a child permission to talk openly about his/her feelings may be the greatest gift you can bestow on a child who has a loved one living with cancer. Often, children believe that it is not okay to talk about their feelings. Sometimes they may not even know how they are feeling, or perhaps they do not have the words to express themselves; and, then there are children who simply act out their feelings - perhaps in negatives ways. 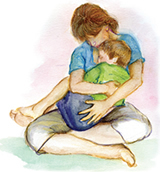 On these pages, the child in the book talks about a wide array of feelings, providing the needed words and the opportunity for you and the child you are reading with to share how you both may be feeling. Coloring and writing are great avenues for expressing one's feelings. Return to the coloring/journaling sheets on our website for more pages on which the child can draw his/her feelings. Make a list with the child of all the people he/she could talk to about his/her loved one's cancer. To help facilitate this list, Nanci and I have provided a form for your use. Visit our People I Can Talk To button. As a precaution, before placing people on the list, you may want to speak with them to assure that they are indeed comfortable talking with the child about the loved one's cancer. At the end of the story, you may want to encourage the child to discuss anything else that he/she may need clarified. It is our hope that Butterfly Kisses and Wishes On Wings Book is a book the child will want to visit and revisit many times, giving the child a continued sense of hope and understanding.